For a moment, one is tempted to think that Eugene Trivizas had invented his own biography. Criminologist and writer; one person, one life, two identities. Eugene Trivizas, author of more than 100 children’s books, is one of the most important contemporary Greek authors for children. He received his LLB degree in Athens, followed by a B.Sc in Politics and Economics and an LL.M degree in Comparative Criminal Law from the University of London, where he was also awarded his Ph.D in Criminology. He is currently barrister at law and a visiting Professor of Criminology at the University of Reading, Great Britain, where he was he first Director of Criminal Justice Studies. For more than thirty years, he has been involved with almost all genres of literature: fairy tales, poetry, stories, humorous historical texts, opera librettos, children’s theatre, comics and educational software. 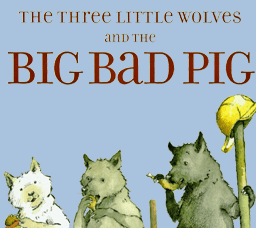 Trivizas’ picture book “The Three Little Wolves and the Big Bad Pig”, became an international best seller after his adaptation of the classical fairy tale had lain around on his desk for years, because no publisher was willing to publish a book in which the wolf is not evil, but good. Modernised into a work as entertaining as it is profound, it has been translated into seventeen languages and has been incorporated into the Heinemann collection of the ten best classic picture books ever published. Trivizas’ surrealistic humour and his creative use of language are unique. A charming teller of fairy tales,Trivizas must be taken seriously in his infectious enthusiasm for the limitless and the phantasmagoric, for beauty and tragedy in the world. Behind his stories’ fabulous and humorous “cloaks”, serious social issues are concealed. His latest publications include the Olympic novel “Despina and the dove”, which has been published by the ATHENS 2004 Organising Committee for the Olympic Games and “A Swallow over Europe”, an as yet unparalleled book project for children about European integration. Combining fairytale and humorous storylines with serious contemporary subjects, linking comedy and tragedy, Trivizasí books are equally appealing and attractive for children, young people and adults alike.